Biconi is a cosmetics brand producing high-end personal care products with 100% natural ingredients. They use the finest and most effective ingredients such as virgin coconut oil and noni to create natural skin and hair care products. Their biggest challenge was high customer acquisition costs. The low conversion rate of their site combined with a very competitive market made it very difficult to acquire customers. They already optimized their marketing funnel as much possible but they were missing the expertise to improve their site for better conversions. And that’s when we came to help them. Our Ecommerce Audit indicated an underperforming checkout page and high exit rates on product pages. It resulted in problems with converting their hard-earned traffic to actual sales. The audit results helped us create a mobile-first conversion optimization strategy with data-driven hypotheses and we started with A/B tests to collect measurable results and customer insights. The results we achieved when working with Biconi for six months speak for themselves – 143.7% conversion rate increase. John and his team are the real experts and delivered great results. They helped us fixed our website conversion and identified many user experience issues we didn’t even notice.. The original checkout page suffered a high exit rate of 76.1%. The data analytics, UX research and session recordings showed the main reason – the checkout page is not intuitive at all. It had complicated, multi-step process, which users found very difficult to use. We focused on simplifying the checkout page as much as possible and created a new “Variation A” with an easy-to-follow layout. We removed the multi-step setup and reduced the number of fields to make the form short and sweet. The analytics data also showed that 94.8% of customers used the same billing and shipping addresses so we made the shipping address same as billing by default. We also removed all exit paths from their checkout page (e.g. menu or cart icon) to make sure the customers are not distracted while finishing their purchase. “Variation A” increased the checkout page conversion rate by 88.5% with 98.9% chance of being the best compared to the original. It made dramatic results in their marketing campaign ROI and acquisition costs. Our audit revealed high exit rates and low add-to-cart rate on product pages. After performing qualitative research, we discovered their customers have concerns about products delivering results. They were searching for a social proof to make their purchase decision. On top of that, their products are in the premium pricing range, and our research revealed that many visitors didn’t see the reason to pay more money for their products. Especially compared to some of their cheaper competitors. We created “Variation A” that includes additional social proof with a number of recent purchases of each product (e.g. X people purchased this product). We also highlighted product reviews and included the latest two directly below the main call-to-action. Next “Variation B” extended the “Variation A” with additional unique value proposition explaining the fact their products are made from 100% natural ingredients by hand in a family operated business. That’s something that makes their products unique compared to the big brands, and it helps their customers understand why it’s worth the extra money. The “Variation B” combining social proof with unique value proposition resulted in 25.1% increase in add to carts. The most important metric was their actual sales that increased by 14.9% with 97.1% chance of being the best compared to the original. Even after improving their checkout page, we still saw a 72.5% cart abandonment rate. We noticed their customers very often need at least 2 sessions to finish their purchase. We needed to address the cart abandonment without paid ad retargeting because we didn’t want to stretch their marketing budget any further. That’s why we picked email as the main remarketing channel. The biggest challenge was collecting email addresses from new visitors to be able to get in touch with them. We tested multiple variations such as exit intent pop-ups or top banners but the best-performing one was “slide in” with a special offer. We used targeting only for visitors who spent at least 30 seconds on a product page or added a product to their shopping cart. The special offer was 10% OFF the first order – something they offer in many of their paid ads. We A/B tested the different variations, and the final “slide in” resulted in 12.5% subscription rate. It also helped with increasing their sales by 8.6% with 96.1% chance of being the best option. The next step was implementing the retargeting email campaign. 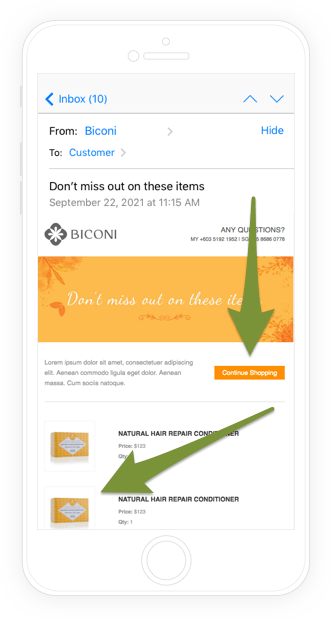 We used our personalization engine to track customer behavior and send two different email campaigns (abandoned browse and abandoned cart) with the exact product they were interested in. We analyzed the returning visitor data to come up with abandoned cart campaign schedule. The data showed the frequency how often visitors return to the site, and we created a series of 3 different emails sent after 2 hours, 12 hours and 3 days. We also used links in emails that allow customers rebuild their cart on any device. It’s very important for older demographics because many people will always prefer purchasing on a desktop instead of mobile. The retargeting strategy reduced cart abandonment by 19.3% and increased their sales by 12.3%. As you can see, simplifying the shopping process is rewarding to user experience and conversion rates. When it is easy to navigate your site and understand product value, you can be sure that your conversion rate follows the upward trend. Biconi’s results show that homegrown products and brands gain from storytelling. If your company and products are the same as Biconi, putting in a little creativity in showing how your company and products came to be may be rewarding for your bottom line as well. Given our structured conversion approach, we were able to arrive at these results and valuable insights after a series of much successful and some unsuccessful A/B tests. In fact, we had 81% success rate. Traffic to your store is great, but why do most of your visitors never purchase? We help you increase your conversion rate and average order value to unlock your hidden revenue potential. Converting more visitors and increasing their spending is the way to beat your competitors. If you don’t do it, they will and it’s gonna be even more difficult for you. Get a FREE Mobile UX Assessment of your online store. Our conversion expert will review your site and give you highlights of your main mobile issues that stop your visitors from converting. We offer only 7 free assessments every month so make sure you catch yours quickly.